This should be a concern for both sides of the aisle – Republican and Democrat – but it’s not. Why? Republicans want voter ID to ensure the integrity of elections, Democrats want to continue stripping any remaining shred of integrity from the elections. The nation’s voter registration rolls are in disarray, according to a report released Tuesday by the Pew Center on the States. The problems have the potential to affect the outcomes of local, state and federal elections. Inaccuracies include nearly two million dead people, and nearly three million people with multiple state registrations. “These problems waste taxpayer dollars, undermine voter confidence and fuel partisan disputes over the integrity of our elections,” said David Becker, director of election initiatives at the center. The Times report actually hints that an online system that uses voter ID may be a solution. One possible response, employed in Arizona and Washington State, is to allow online registration, which is cheaper, more accurate and more convenient but may raise security concerns. Ms. Lamone, the Maryland election official, said her state for now “is completely paper based” but would allow online registration starting in July for people with a valid state driver’s license or military identification. The Congressional Black Caucus … took to the House floor to charge that voter ID laws popping up around the country are aimed at dissuading minority voters from voting, and making it harder for President Obama to win re-election. According to the Pew study however, it would appear that failing to shore up these voter registration flaws is actually detrimental to underprivileged communities. Using Juan Williams guide to racist code, we of course understand that poor actually means black. The flaws in the voter registration rolls have a disproportionately negative impact on mobile populations, including students and other young people, the poor and members of the military, the Pew report found. That makes it official. 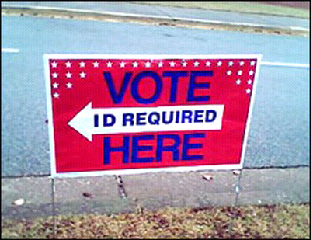 Failing to push for voter ID is racist. But then, we all knew the Democrats were projecting the entire time didn’t we?